Suzdal, Russia - Students Helping Children Across Borders, Inc.
Suzdal is a rural town of Russia located in the Administrative division of Vladimir Oblast. The town has a population of 10,535 and was founded in the year 1024. Home to the World Heritage Site “Cathedral of the Nativity”, Suzdal retains the looks of a small village frozen in time. It is not uncommon to see livestock on the city streets as well as mostly unpaved roads. Suzdal houses many residents in need of modern amenities. The local school, which serves the children of the community, lacks an outdoor equiped recreational space; however, SHCAB plans to change that. The current project plans include establishing a recreation center for the school comprised of a playground, athletic fields, and sports equipment to found physical education programs there as well as an outdoor recreation center for the community. 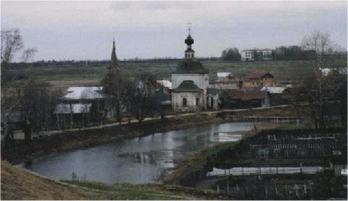 A community like Suzdal, rich in history and medieval architectural brilliance, deserves the ability to give its children an educational environment equipped with the facilities to foster self-esteem, teamwork, and healthy lifestyles to enhance the socio-economic conditions of the greater community. Although seemingly stuck in time, Suzdal is certainly not immune to the social pitfalls and problems that are prevalent in modern Russia. In fact, these issues are often exacerbated in more rural and modest areas like Suzdal where the average family income is only $450 per month. The greatest social threat in Russia today is alcohol. Current alcoholism rates in Russia are among the highest in the world and more than 20% of all male deaths annually can be attributed to alcohol. This high rate of alcohol consumption has undoubtedly helped fuel the vicious cycle of drug use, teenage pregnancy and abortion that currently plagues the country. SHCAB, however, is determined to disrupt this cycle. It has long been well documented that constructive recreational opportunities and health education programs have the ability to positively affect childhood development. Sports programs are capable of developing self-esteem through the cultivation of interpersonal relationships, effective problem solving and rational decision-making. These activities also act as an outlet, and serve to keep children busy and engaged throughout the day. Moreover, access to vital information through a health education program, especially at a young age, has been shown to enhance a person’s ability to make positive choices in the future. Hence, by creating a comprehensive wellness program of athletics, education and information, SHCAB is providing the town of Suzdal with the tools necessary to permanently break the cycle. For more information on the challenges facing Suzdal, click here.